Budding nine-year-old jockey, Arron Butterfield from Somerset, was set a school challenge to raise money for Children in Need. With the task in hand, the youngster came racing to Wincanton and took the initiative to ask over twenty top jump jockeys to sign a pair of his pony racing breeches. Arron was treated to a behind-the-scenes weighing-room tour and even managed to capture signatures of former Channel 4 Racing presenter, John Francome and Olympic Gold medallist, Nick Skelton. The framed breeches were auctioned at Wincanton Racecourse on Saturday, 5th January and raised £210.00, with Sarah Aston from Wiltshire being the successful bidder. 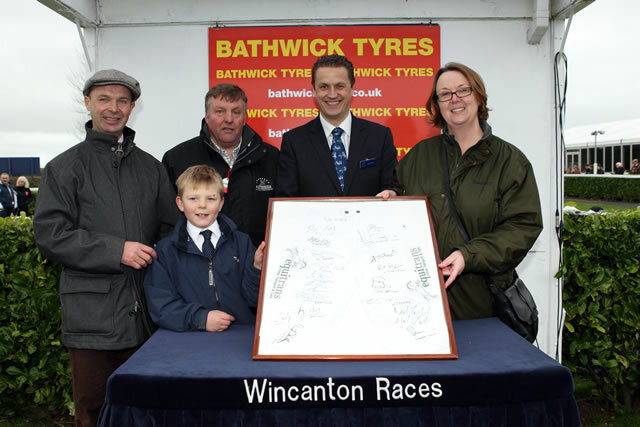 "Visiting Wincanton today is part of my 2013 challenge to attend every racecourse in the UK and winning breeches signed by John Francome, AP McCoy, Ruby Walsh and others is a real bonus." "Because the jockeys' were ace and really kind to me, I decided to split the money raised between two charities - Children In Need and the Injured Jockeys Fund. I want to be a jockey when I'm older and will continue to come racing when I'm not at school!" To recognise Arron's achievement, the Injured Jockeys Fund has officially invited him and his family to Oaksey House in Lambourn, the centre dedicated to assisting jockeys, for another racing experience and insight.